Yesterday was one of the loveliest days of my life, hands down. Not much beats soaking up sunshine in nature, spending the day making friends with strangers and trekking down little footpaths to enjoy clear, warm(ish) waters. The Lake District is where I grew up, so being in familiar surroundings made yesterday just that much better. Alex and I headed by train to Windermere, one of my favourite places in the Lake District, to have a swim and get some well deserved chill time as we've both just finished our degrees (I got a 2:1!!). The weather was a fine 25-28C and I could feel my legs radiating heat on the lake shore whenever I stepped out of the water. Around us were a few families cooking up kebab sticks on disposable barbecues, sipping on beer and splashing around in the lake. It was pretty peaceful until around dinner time when a few more people had the same idea, but to be in like-minded company was sweet. As kids we're always told not to talk to strangers but how else are we supposed to make friends?! While swimming I met a guy called Ayjuan (sorry if you ever read this and I've spelled it wrong, haha) who was from Mexico, visiting the Lake District to have a 'break from life', and a young girl called Olivia from Poland. A woman who had an awesome American accent was painting on the shore which made me completely regret not bringing my watercolours to make some art! We had a swim together and her husband who was kayaking sailed up before she got up on the back and drifted off for a while. I've been canoeing before but the thought of kayaking terrifies me a little haha, being stuck in that tiny hole with the possibility of rolling under? No thank YOOOOOU. Very peaceful to watch, nonetheless. Looking up at the sky, letting myself just float and be free was one of the nicest experiences of this year. I was careful to keep an eye on the treetops so I knew how far out I was drifting, as some of the Lakes in the Lake District (Coniston especially) are known to have sudden drops in depth. Definitely something to remember if you're thinking of wild swimming here or aren't a very good swimmer! Surprisingly the water was alright [see videos here and here] when you got used to it, though only the top few centimetres were properly warmed by the sun! 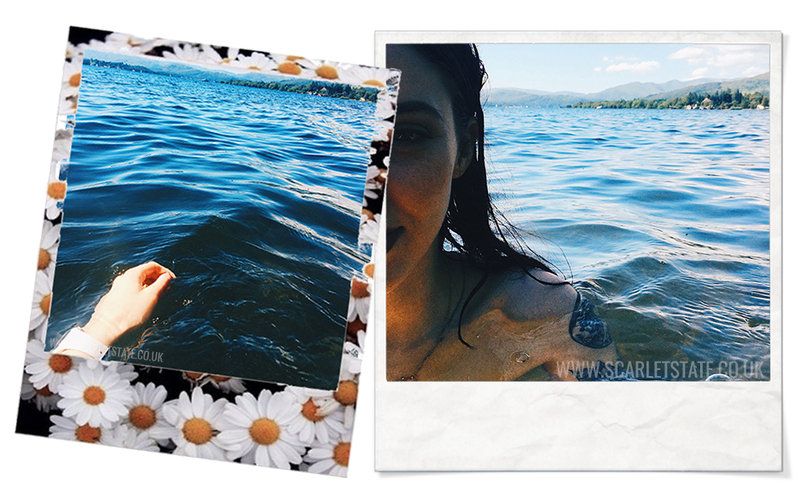 NO pool, ever can beat swimming in a lake. Not even mineral treated spa water, sorry Centerparcs. My hair actually felt conditioned when I ran a brush through it later on, unlike salty beach tangles. We headed back to the station after a long, lazy, well-rested afternoon, taking a short-cut up a single road into the centre of Windermere. As it was Sunday, the town wasn't super busy and we were able to mosey without getting in anyones way. 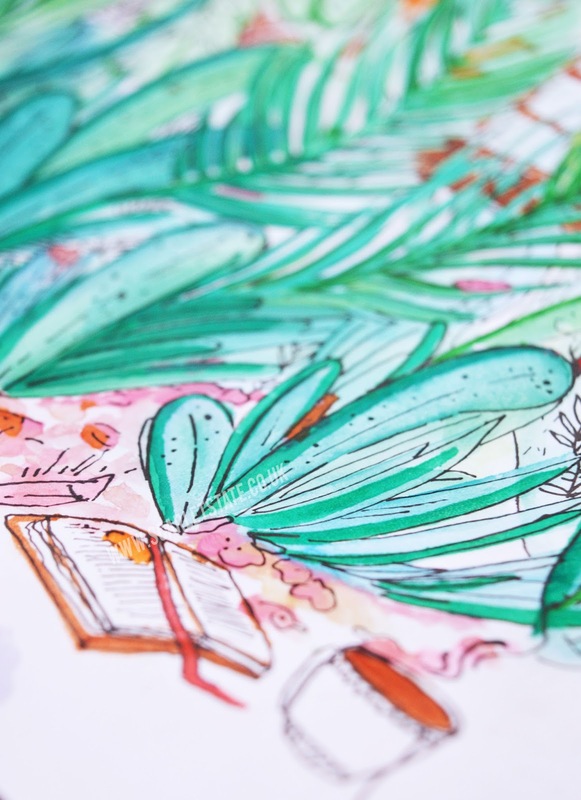 I stopped a few times to take pictures of beautiful colour palettes for illustration reference (as you might know I like to do from reading my Instagram) and petted a couple of dogs who ran up to us from the drive of a very swanky looking woodland home. We boarded the train which was thankfully delayed, or we'd have had to wait at the station for forty more minutes and stupidly had forgotten to pack extra water so we were preeetty thirsty! Wishing that I could go back to the moments of being in the water because as I write this, it's a sweltering 28 degrees. We've been BLESSSSED with such good weather this weekend! Just in time, before Alex and I move into a new place and have to spend a week packing indoors. If you ever get the chance to visit the Lake District and want to swim, I'd recommend Conistion, Windermere, Fell Foot and Buttermere. A lot of Windermere's shore is privately owned so head to the Outdoor Adventure Centre and walk through the field towards the shore (public access). If you're in Coniston there are plenty of jettys and car parks so you can stay as long as you like. Fell Foot has the cutest little café but gets quite busy on sunny days! 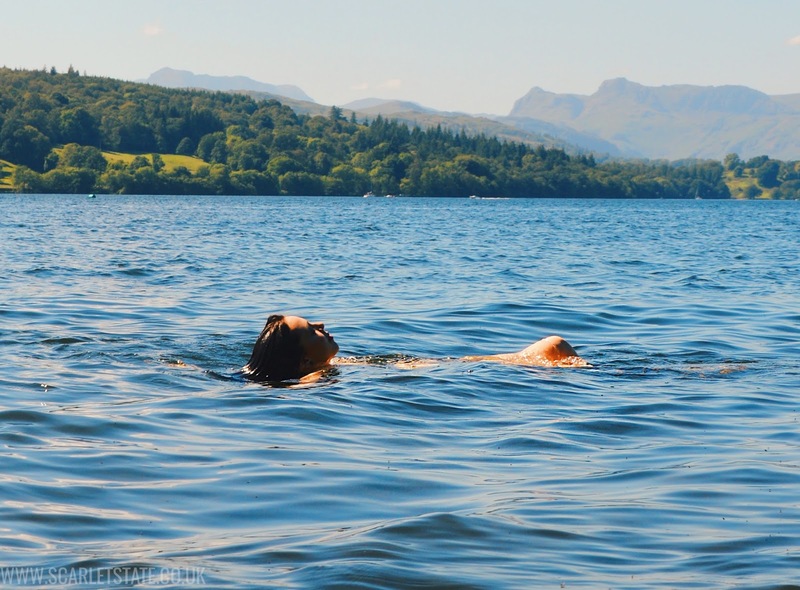 I've also heard Loch Lomond is one of the top outdoor swimming spots in the UK, which we visited last year. How have you spent this glorious weekend? Have you visited the Lakes before?